Blackburn have signed South Africa international midfielder Elrio van Heerden on a free transfer from Belgian side Club Brugge. The 25-year-old, who began his career in Denmark with FC Copenhagen, has signed a two-year deal with Rovers. Manager Sam Allardyce was looking to boost his midfield, with Aaron Mokoena joining Portsmouth and Tugay retiring. Capped 25 times by South Africa, Van Heerden is with the Bafana Bafana squad preparing for the Confederations Cup. The versatile midfielder, capable of playing in both wide and central roles, is Allardyce's first signing of the summer and joins compatriot Benni McCarthy at Ewood Park. He suffered an injury-plagued 2008, enduring ten months on the sidelines with a knee injury that ultimately required surgery. "We've signed a very talented young man, I think it is a great addition," Allardyce told the Blackburn official club website. "He's had a couple of injuries which have been hiding his talents for a while, but we've monitored him over the last few months. "He was here on Monday and flew through our Premier League standard tests." I know he cost us nothing, have we replaced the axe with the hacksaw? Allardyce is hoping to tie up a permanent deal for £3.5million-rated full-back Gael Givet after a successful loan spell from Marseille last season. 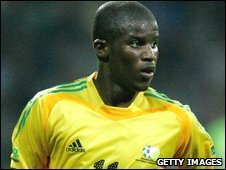 He is also adamant that star players such as Stephen Warnock and Chris Samba will not be sold. "We are looking to build a squad here, rather than dismantle one," he said. "So no-one will be leaving this summer unless I feel it is in the best interests of this football club. "The majority of them are on decent length contracts so I am quite relaxed about the situation."